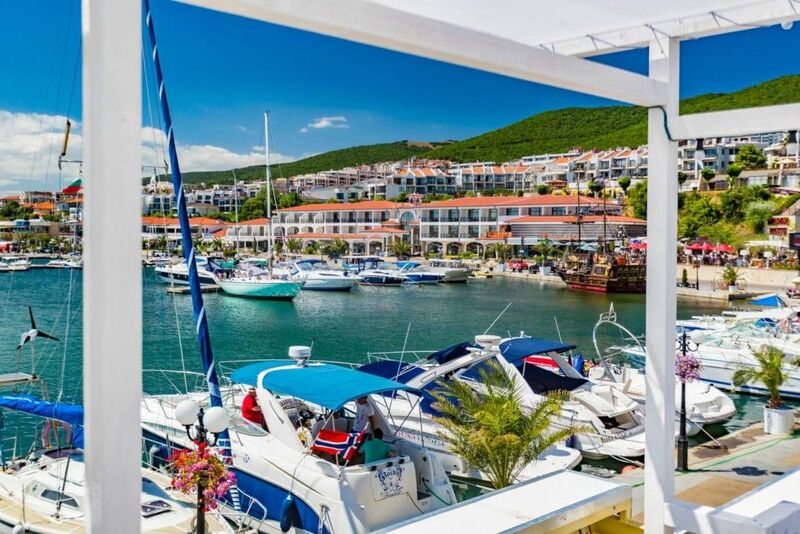 Admiral complex is a cozy, prestigious, “premium class” residence, which is located on the third line from the sea in the southern part of Dinevi Resort. The complex is designed exclusively for the connoisseurs of luxury and comfort. The complex offers a restaurant, several shops, an outdoor swimming pool for adults and children, a prestigious spa centre with a heated pool, various kinds of massage, saunas, Turkish bath, Jacuzzi, a beauty salon, a fitness centre, a conference hall, a three-level underground parking place. Parking spots in an underground garage are sold in the complex! The complex is part of DINEVI RESORT — the foundation of Sveti Vlas — more than 40 scenic complexes, nestling in the nature as a unified architectural ensemble. They are tied together with a modern infrastructure, landscaped and lighted shopping streets, chic boutiques, elite restaurants and bars, golden blue flag beaches, Marina Dinevi Yacht Port, beauty salons, sports facilities, churches, Amphitheater, medical centres and countless entertainment options. 106 apartments, ranging between 24 and 140 sq. m., among which studios, one-, two- or three-bedroom apartments you can choose from. The apartments in the complex are meters away from the sea and in close proximity to the amenities Dinevi Resort offers. The complex offers a swimming pool for adults and children with a view to the sea, amidst a wonderful landscaped garden. Residents in the resort have also a heated indoor swimming pool, various kinds of massages, saunas, Turkish bath and jacuzzi at their disposal. The complex has a fitness center and a beauty salon. The complex has a three-level indoor parking lot, where you can choose your parking spot and purchase it. The complex has its own restaurant with a refined menu and selected drinks. A variety of shops within the complex. A conference hall for meetings and various events is at the disposal of residents in the complex too.